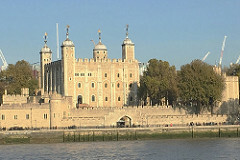 London’s Top 5 medieval buildings | London My London | One-stop base to start exploring the most exciting city in the world. OLDNESS is not what it seems. I have walked passed Westminster Abbey for decades thinking it was a bastion of medieval solidity. Not so. At least, not on the outside. Hardly any of the edifice is that old, apart from occasional bits of old stone visible near the foundations. The rest has been replaced over the centuries. The same is true of Southwark Cathedral – formerly St Mary Overie – which existed in some form or other long before old London Bridge – the one with houses on top – was built. Only the very eastern end survives in its medieval form. Likewise with Grays Inn, where Shakespeare’s troupe once performed and which occupies almost exactly the same site as Lord Grey de Wilton’s original “inn”. Nothing from its medieval hey days remains apart from a font embedded in the wall, some stained glass and recycled bricks. So, where is medieval London? 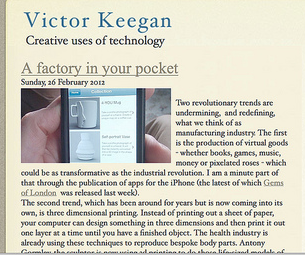 In the course of researching an iPhone app on medieval London – to join those on the right of this screen – I have been trying to sort the true medieval from the reconstructed. If I had to name a Top Five then first would be the White Tower of the Tower of London, a globally recognised icon that is much as it was – bar a few window changes by Christopher Wren – when William the Conqueror had it built in the late 11th century. 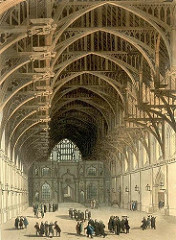 Close on its heels must be Westminster Hall, built by the Conqueror’s son William Rufus with its amazing hammer beam roof – still claimed to be the biggest in the world – installed by Richard ll. When some of the beams had to be replaced a century ago the wood was taken from trees which were already growing 600 years ago in the same woodland as the original oaks. Only in England . . . The third may be a surprise. St Ethelreda’s is the former chapel of the Bishop of Ely’s London palace in Holborn which for most of recent history has been a legal part of Cambridge, not London. It is difficult to see as you enter the approach road – though not as difficult as the Mitre inn built by Bishop Goodrich in 1546 to feed his workers. This is concealed down a nearby alleyway,which separates the church from Mammon’s Hatton Garden, the centre of the diamond industry. St Ethelreda’s is one of the very few structures in London surviving from the reign of Edward l (1274 – 1307). 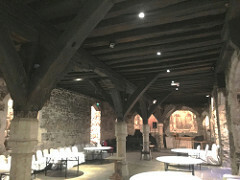 Nearly all of the walls and the crypt beneath where (see photo above) you can still see the original beams on the ceiling are very old. The church, almost miraculously, has survived two world wars, the Reformation and the Great Fire of London which changed direction at the last moment. Inside there is a holy calm yards from the bustling city of London. Truly a gem.